Add a rustic touch to your kitchen decor with a new sink. 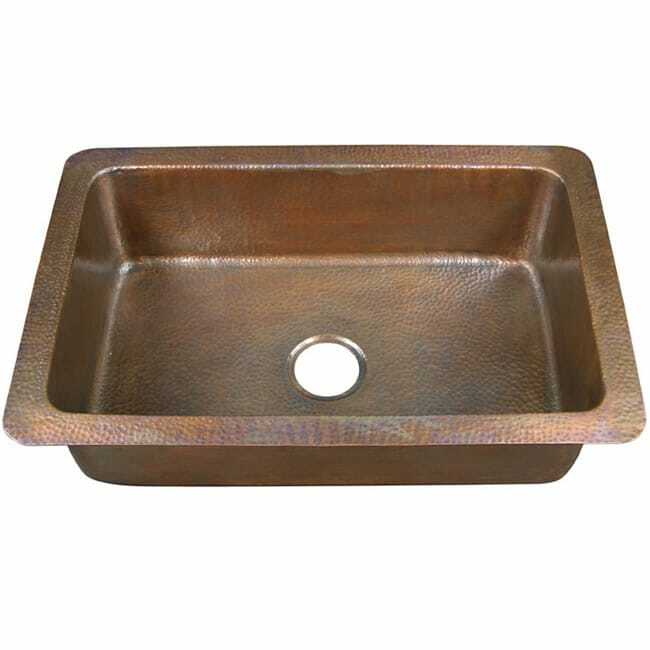 This large drop-in sink is crafted of copper and features an antique finish. Pres. of Man Around the House inc. While copper may not be for everyone, or every design, if it is this is a perfect statement for your new kitchen. The construction is both sturdy and well finished. The stone top and the copper sink look as though they were made to go together. If copper is your choice, this is thew right quality at the right price. Can't wait to have it in use! Big, beautiful heavy sink. I can hardly wait until the kitchen remodel is done. Very nice. I prefer undercount. "Is the 32" dimension the most outer point of the flange or is that the actual sink wall dimension? Thanks"
The overall dimensions of this kitchen sink are 32 inches long x 21 inches wide x 10 inches high. "What is the gauge of this sink?" Hello robinshood, this is a 16 gauge. Thank you for shopping with us! "Does this need a drain and which do you recommend for it?" Hi casso, we have the Kitchen, Prep, Bar 3.5-inch Oil Rubbed Bronze Basket Strainer Drain Item #: 14003958 or http://www.overstock.com/search?keywords=Oil+Rubbed+Bronze+3.5-inch+Drain&SearchType=Header. Please feel free to contact us again with any further questions. Thank you for shopping with us! "Does this sink have holes for faucet fixtures?" No, there is only a hole for the drain. "Copper is gauged. The gauge is given in the specifics of other copper sinks on your sight." Unfortunately, at present, this item is presently out of stock. We currently do not have inventory to check, and cannot guarantee the item will be restocked. Please feel free to check back with us periodically to see if the item has returned. "What gauge is this sink? Is the inside hammered?" Copper is not gauged like steel, so there is not gauge to describe. It has an antiqued hammered finish. "Can this sink be undermounted instead of dropped in?" Yes, it can be installed like that.